Look, it is so good it made the front cover! 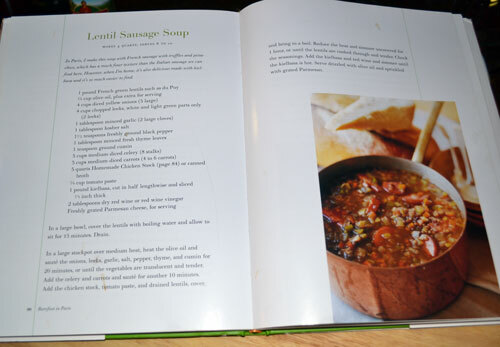 “Family Style” is probably my favorite of her cookbooks; “easy ideas and recipes that make everyone feel like family” – gee, I wonder why? 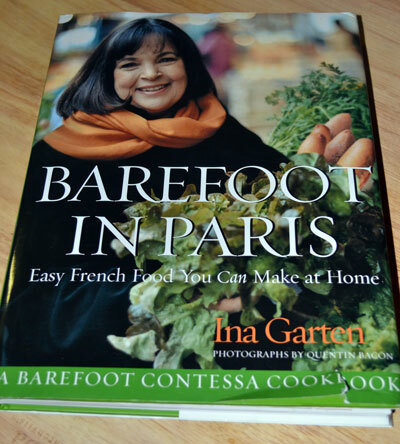 I love “Barefoot in Paris” but as I looked through this one this morning, I realized just how many of the recipes in it I have made and loved. 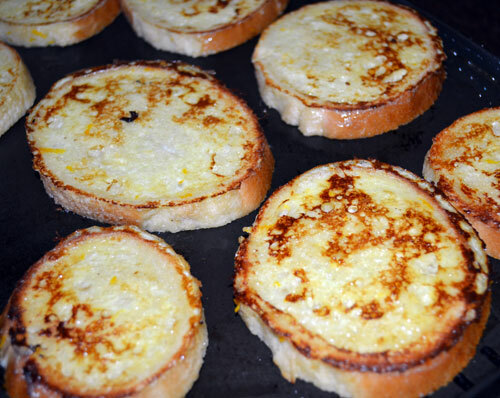 Until recently, I have always just intuitively made french toast, I mean “how hard can it be?” (Ina says that all the time if you didn’t know). Eggs, milk, bread, a griddle. No sweat. 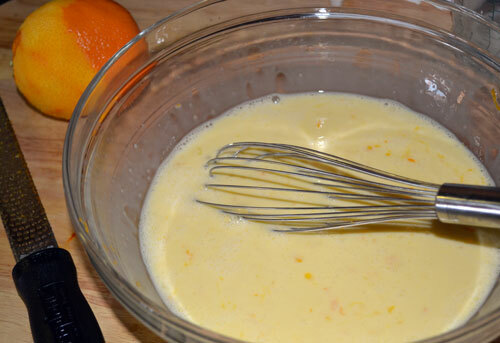 As I became a better cook, I started playing around, adding things like a bit of sugar, a splash of vanilla, a shake of cinnamon and a little orange zest. Precise, I know but the results were pretty yummy. 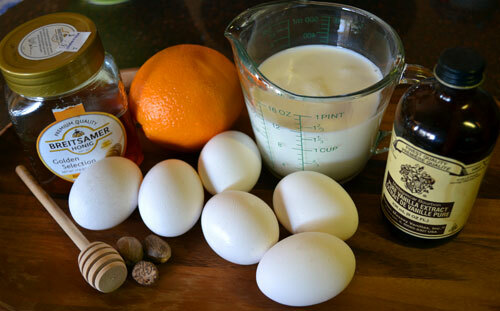 Then one day, I wanted to look up an exact egg to milk ratio – mostly out of curiosity – so I took a peek at this challah French toast recipe. 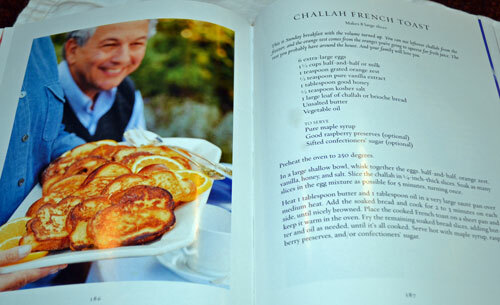 I was excited to find that I was making French toast very similarly but the Barefoot Contessa always does it best. 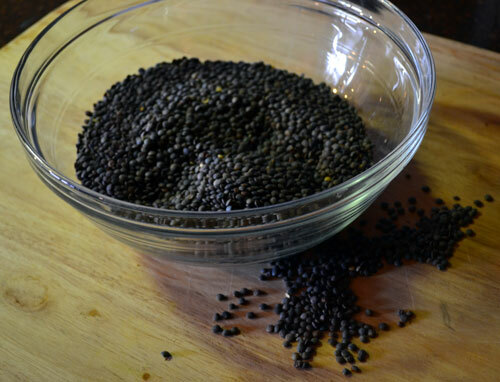 I now have the ratios right and have dropped the sugar for honey – which is far better. I’ve dropped the cinnamon but do like to grate in a little bit of fresh nutmeg, which she does not call for but I love. 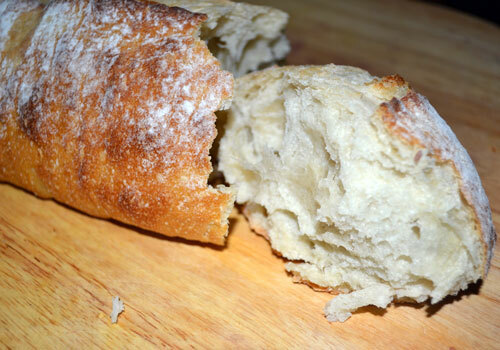 I also use a rustic artisan bread but will try it sometime with the challah – which I know will be amazing. Click the highlighted link above and it will take you right to the recipe. 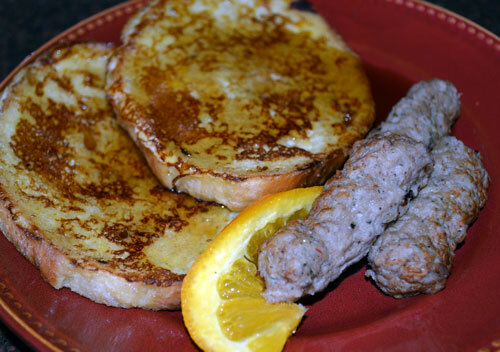 For me, the orange zest is what really makes this French toast something special. 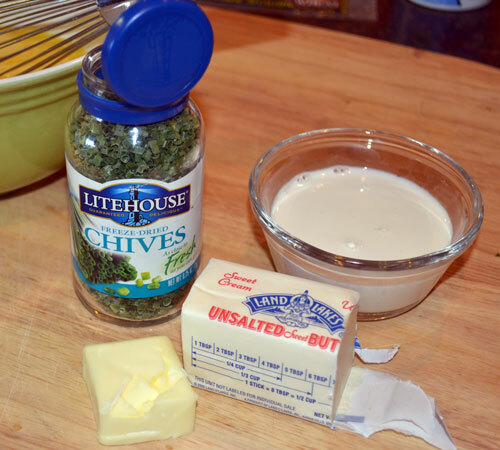 Just like pancakes, a little butter on the griddle will give you a nice crust and a rich flavor. 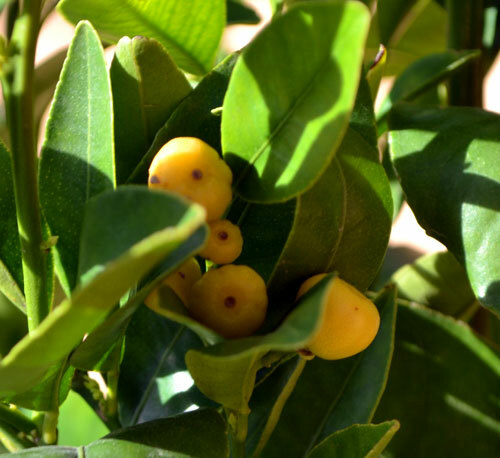 Mmmmm, I can smell the perfume of the orange zest, nutmeg and butter right now. Of course, it is all in my head because I have been eating oatmeal and berries all week; a breakfast I do enjoy but it is impossible for me to write about this French toast and not dream about the scent of sizzling butter. Thankfully, dreaming is calorie free. There are those turkey sausages again, which are made even better when they are nestled in a pool of warm maple syrup that has runneth over the French toast, a gooey rich cascading stream of sweet indulgence (sorry, all week – oatmeal and berries). Is there anyone out there who does not like it when their sausage mingles with their maple syrup? Anyone? I can think of no one. I will let you in on a little secret. I like to make this with the thinner sliced Italian bread because I always make enough for leftovers and then freeze them so they can be popped into the toaster for a quick kid breakfast on a busy morning. Sure makes for a happy kid! 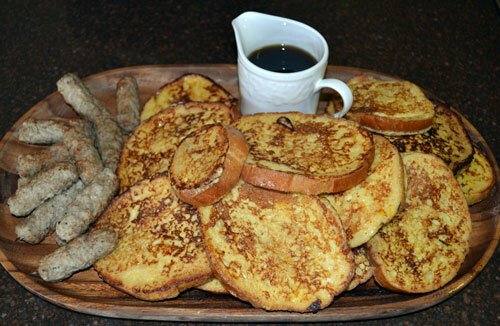 This entry was posted in Breakfast & Brunch, My Favorite Recipies, Welcome Company and tagged Barefoot Contessa, Breakfast, Brunch, Challah French Toast, cooking, food, French Toast, Ina Garten, Turkey Sausage on February 28, 2013 by Welcome Company with Danielle. 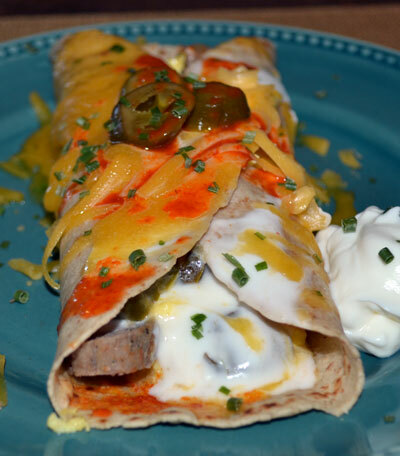 This past weekend, I whipped-up a Brewer breakfast favorite, Breakfast Burritos. 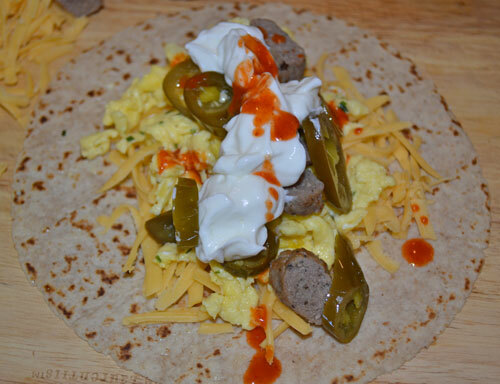 What I love about breakfast burritos is not only are they super yummy (yes, super yummy – I live with a five-year-old) but they are so easy to make very healthy and to customize to individual tastes. 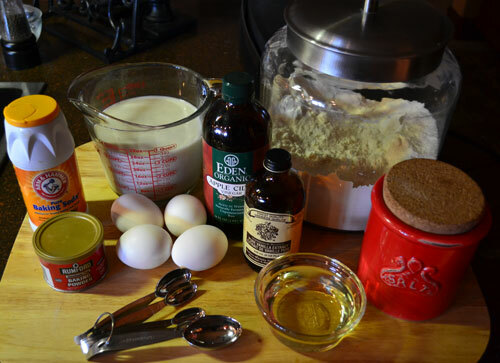 They are incredibly versatile and just beg for you to change-up the ingredients and experiment a little. 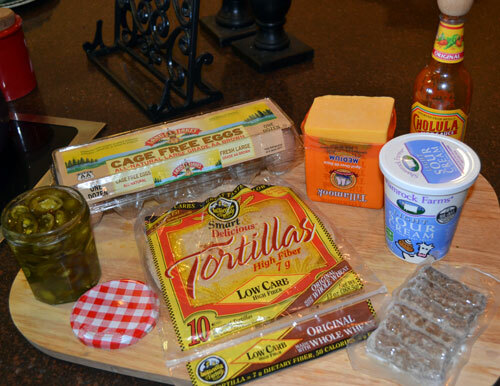 My intention with these particular breakfast burritos was to go healthy and lean and also to share with you a few of my favorite things – well, food things anyway. 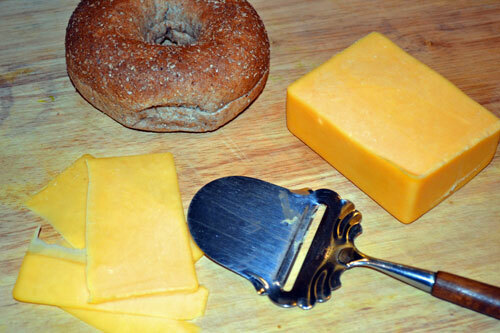 Tillamook medium cheddar cheese, from the block please, I’ll shred it myself thank you. Light sour cream – I can’t do fat-free anything; I’d rather not eat, and that is saying something. 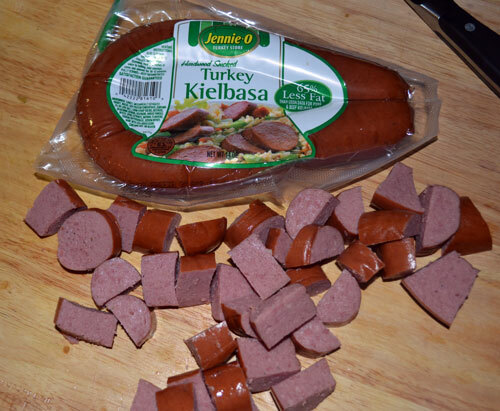 Frozen turkey sausage links – because they are lean and quick and easy and taste pretty good. 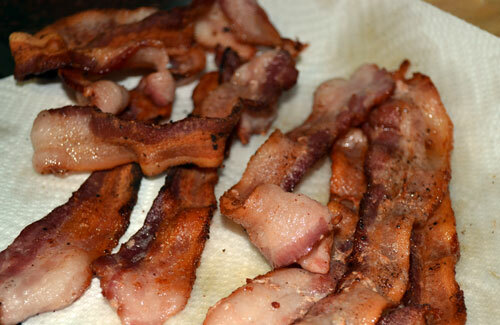 Don’t get me wrong, they aren’t pancetta or bacon or chorizo but they are a good lower calorie substitute. 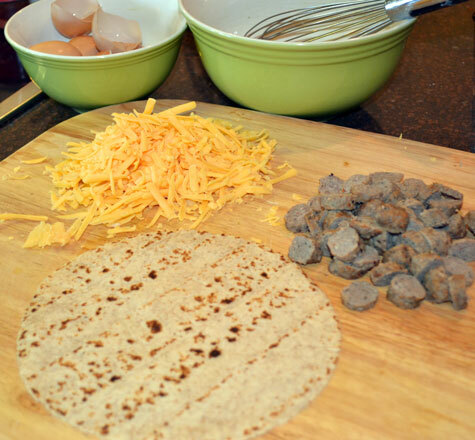 Smart and Delicious low carb tortillas are my favorite – well aside from the real thing, fresh from a traditional Abuela’s kitchen; but were talking low cal and healthy today so whole wheat, low carb, high fiber it is. Jalapeno slices, we eat so many in this house that we buy the giant jar from Costco and store it in the spare fridge where it waits to frequently replenish a smaller, repurposed jam jar. And Chollula, tangy and spicy and awesome (live with a five-year-old). 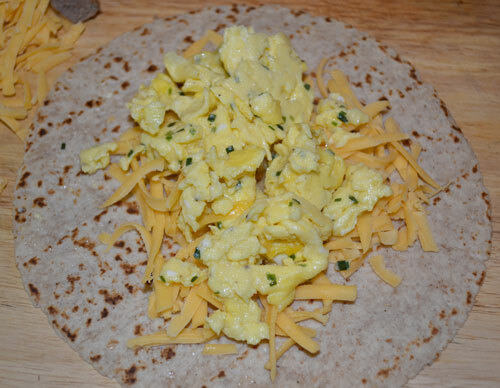 So, in the Brewer house, those are the beginnings of a just about perfect breakfast burrito. 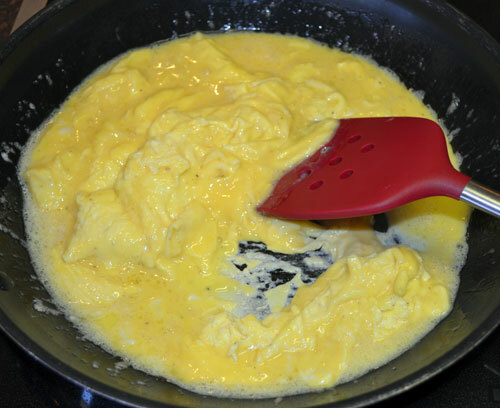 Scrambled eggs. 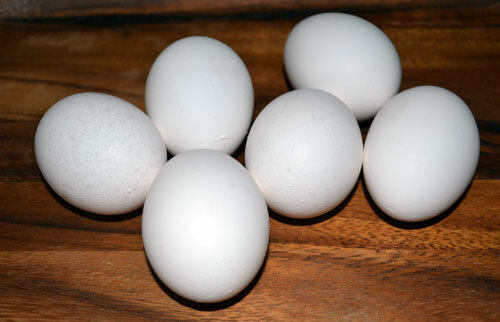 For the five of us, I whisk together six eggs with about 1/4 cup of milk. 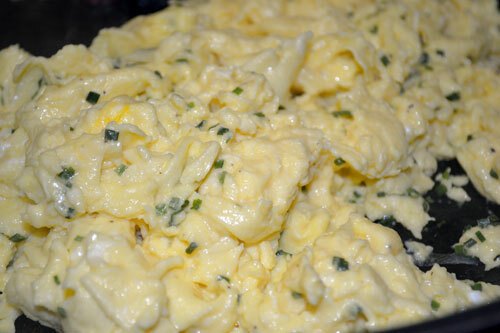 I sprinkle in a few chives after the eggs are in the pan and have just begun to start setting up. 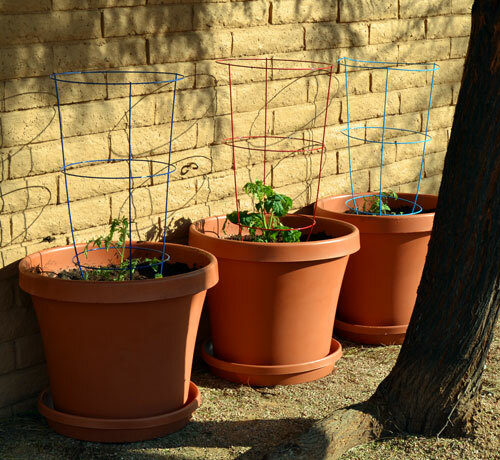 Another favorite of mine are the Litehouse freeze-dried herbs, I love the fresh herbs from my garden but these are great to have on hand. Toss a pat of butter into the pan. Okay, I know we are talking healthy today but it is one pat for 5 people, just one tiny pat for f-i-v-e people. 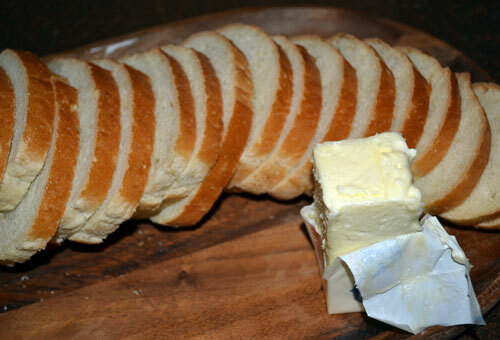 Did I mention butter is also one of my favorite things. Moderation. 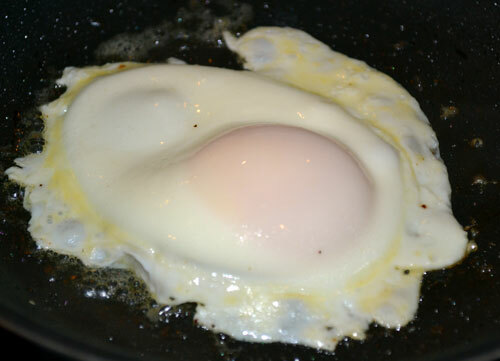 M-o-d-e-r-a-t-i-o-n.
Now that the tiny pat of butter (for five people) has melted in a non-stick pan, pour in the beaten eggs and cook, stirring constantly, over medium-low heat. DO NOT go past 4, don’t do it. 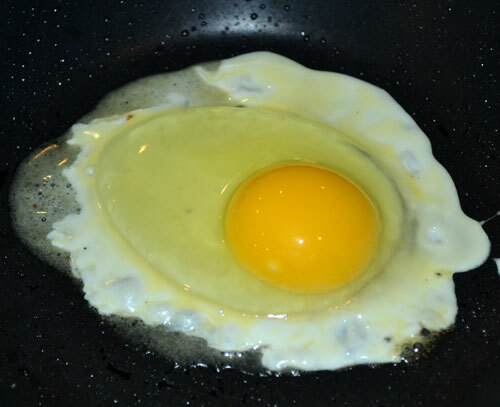 Many a pan of scrambled eggs has been ruined on a burner that is just too hot. 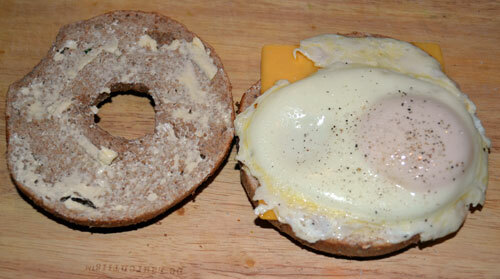 The other trick is to take the eggs off the heat just before they are cooked all the way through. They will finish cooking on their own and will come out silky and creamy instead of rubbery or possibly even crusty, which is what happens when you go past 4 and don’t baby them. When the are off the heat, season with a little kosher or sea salt and pepper. Silky and creamy. 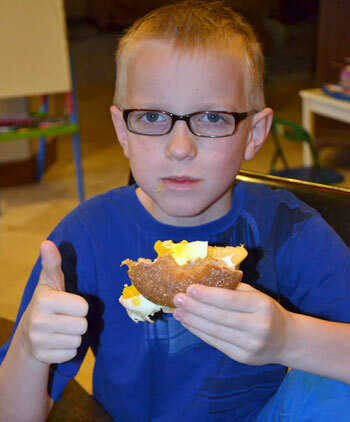 Baby your eggs, baby! 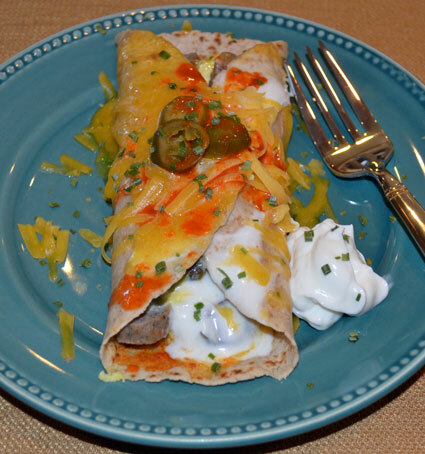 you can start building your burritos – or overstuffing them as is the case with me. 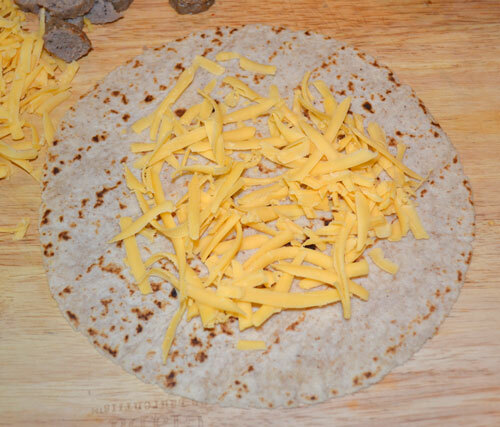 I start with a warm tortilla and put a layer of cheese on first. 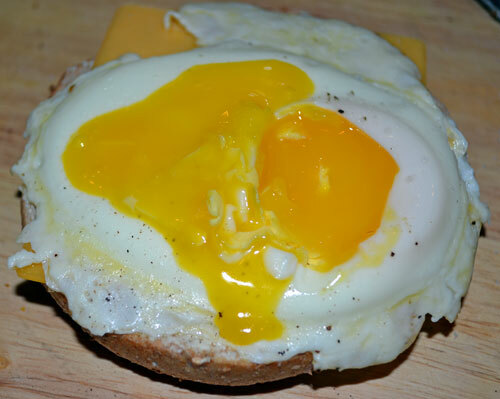 Eggs next (heat from eggs makes cheese melty). Follwed by the turkey sausage – or whatever meat you decide (pick chorizo). 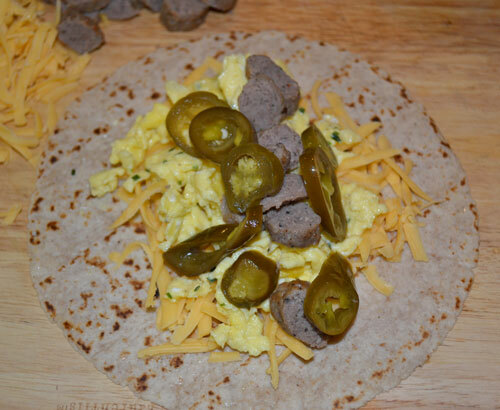 Add the jalapeno pepper slices, remember there’s a big jar in the spare fridge so its okay to be generous. 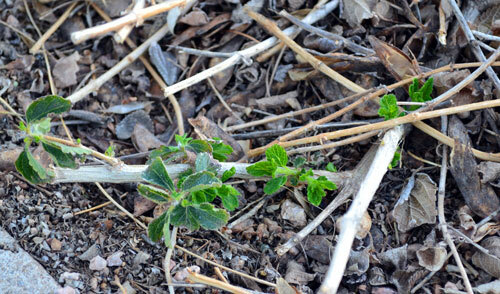 And finally, sour cream and Chollula – guacamole or avocado would be great too, I sadly didn’t have any on hand. Sniff. Roll it up and sprinkle it with a little more cheese, jalapeno and chives and pop it in the microwave for about 30 seconds to warm through and make everything melty. Serve with a dollop of sour cream on the side and guacamole if you have it. Sniff. Such a happy plate. Enjoy! 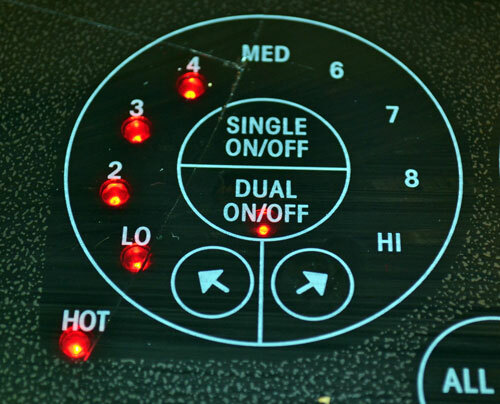 Incidentally, if you noticed that my cooktop has a crack in it, you are a) correct and b) very observant. Glass cooktops DO NOT respond well when cast iron dutch ovens are dropped right smack in the middle of them. Sniff. Just one more reason I miss my gas cooktop. Sniff. Sniff. A replacement cooktop will be here soon and maybe, just maybe, someday gas lines will come to our little “ruralish” homestead. 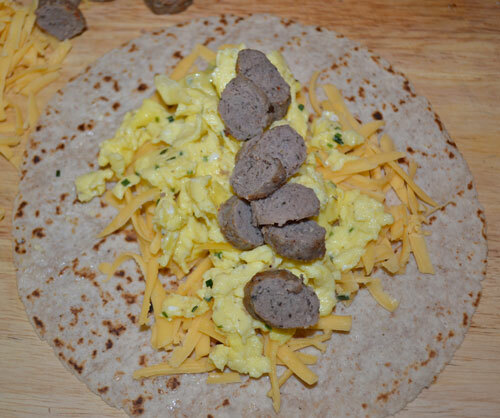 This entry was posted in Breakfast & Brunch, Family Cookbook Project, My Favorite Recipies, Savory, Welcome Company, Welcome to My Kitchen and tagged Breakfast, Breakfast Burritos, cooking, Eggs, Family Meals, food, fresh herbs, Sausage, scrambled eggs on February 27, 2013 by Welcome Company with Danielle. As I’ve thought and prayed about what I wanted to share this week, a number of things have come to mind. I have a multitude of recipes tested and photographed and waiting in the wings. I could do a follow-up on my earlier Lenten posts, one, two, and three. 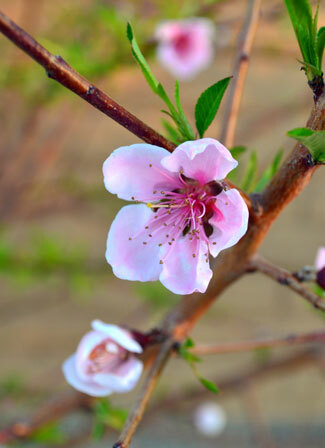 I could share the detox/cleansing diet I am currently on, Lent is all about “spring cleaning” after all; body, mind and spirit – but somehow that just seems to fall into the TMI/oversharing category. Truly, I already feel like I have said too much. I could share the agony of the thousands of lunges the length of my back patio allows for; but honestly they are just to painful to speak of. 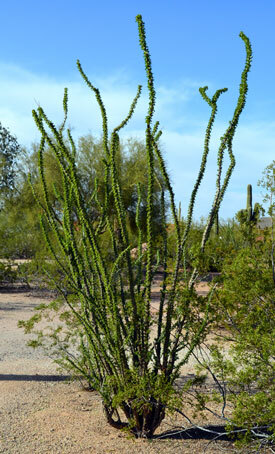 I could talk about the purging of every nook and cranny my home is undergoing – body, mind, spirit and craft room. My blog and family cookbook are now my creative outlet so every unfinished project and uncrafted craft must go. I am so excited to share how God is leading me through the “One Thousand Gifts” devotionals from Anne Voskamp; but I am not quite ready. God is not tugging on those messages yet. So, with all of that, what to talk about? How about Breakfast. All week. Why breakfast? The only thing I can say is because I love it and keep thinking about it. 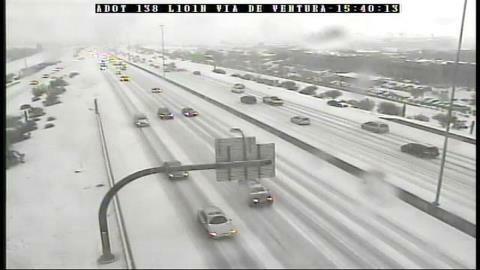 It must be the resurgence of winter. And the cleanse. And the lunges. And the purging. Breakfast it is. My mom was recently here with us for about a month, during which time we cooked our way through A LOT of family recipes. 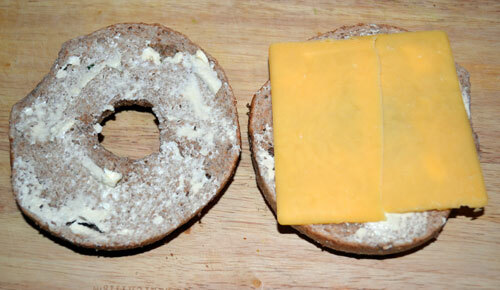 Another reason for the lunges and the cleanse. For something I didn’t want to talk about, cleansing and lunges sure seem to be coming up a lot. I am an over-sharer. Anyway, one of the best and most interesting recipes we tried was for my grandmother’s pancakes; actually, hot cakes, as the recipe says. 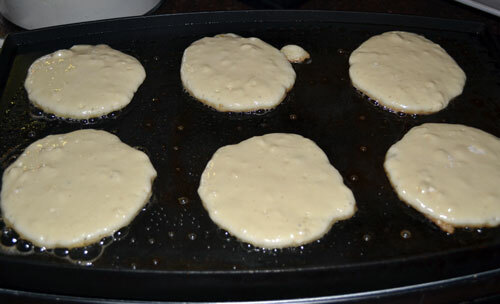 These hot cakes are unlike any I have had before, in my adult life anyway as I had them all the time when I was a kid, I just didn’t appreciate them as much as I should have. 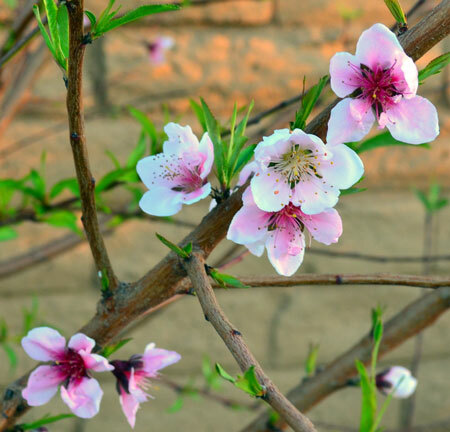 They are unique with an unexpected but delicious twang. I’ll explain later. 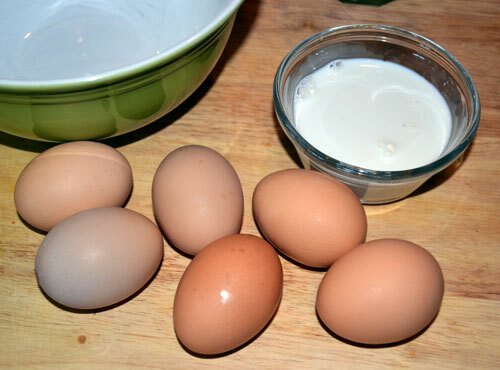 Combine (whisk together) the beaten eggs, vinegar, milk and oil. Combine in a separate mixing bowl the flour, baking soda, baking powder and salt and mix well, either sift together or whisk. 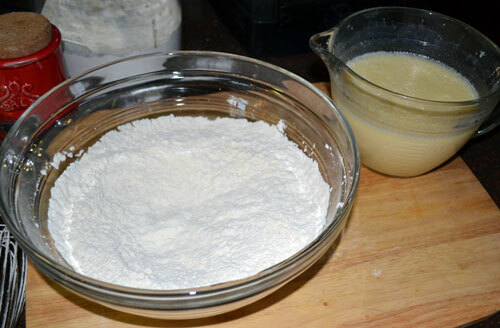 Pour the wet ingredients into the dry and stir until combined and smooth but do not over-mix; some lumps are okay. 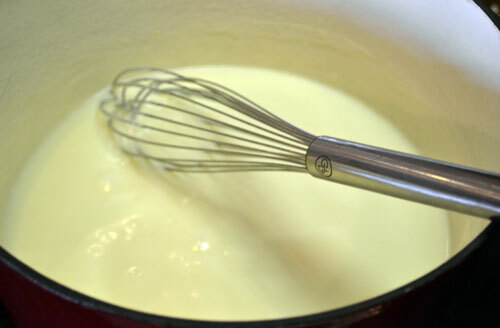 If you over mix your batter, it will get rubbery and tough. We want light and fluffy! Let the batter rest for a few minutes (about 10-15) to allow the baking powder time to form bubbles in the batter, which will make fluffier hot cakes. Don’t stir it again or you will deflate the bubbles. 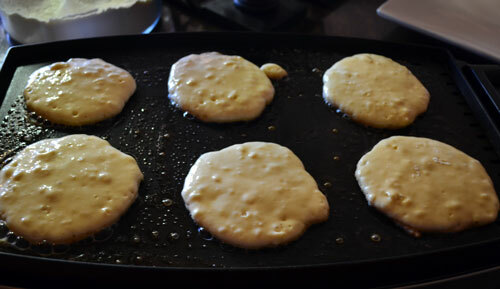 After the batter has rested, use a 1/4 cup measure to ladle your batter onto a hot, buttered griddle (I just take a stick of butter, unwrap half the length of it and run it over the griddle). I set the temperature of my electric griddle between 325 and 350 degrees. 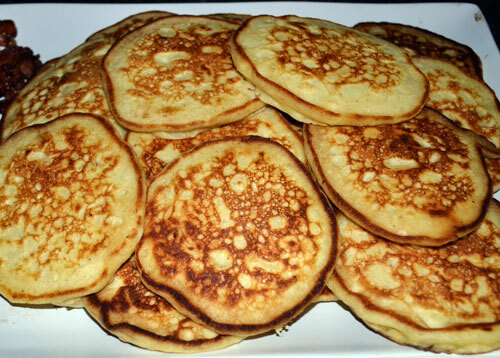 Once the batter starts to develop popping bubbles, it is time to flip. But be patient, don’t flip too early – popping bubbles. No one likes an ooey-gooey hot cake. Sorry for the blurry photo. 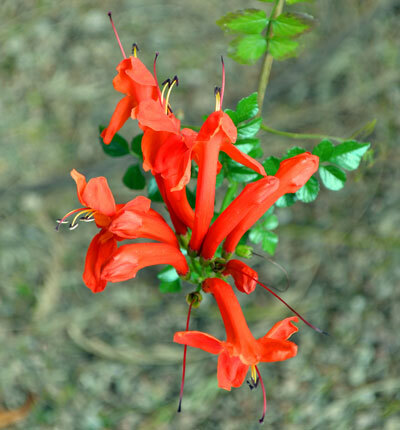 Cardinal rule … always take more than one picture. Yes, even when you have hoards of (three – trust me it feels like hoards) small, starving people staring at you for pancakes. There, that’s better. 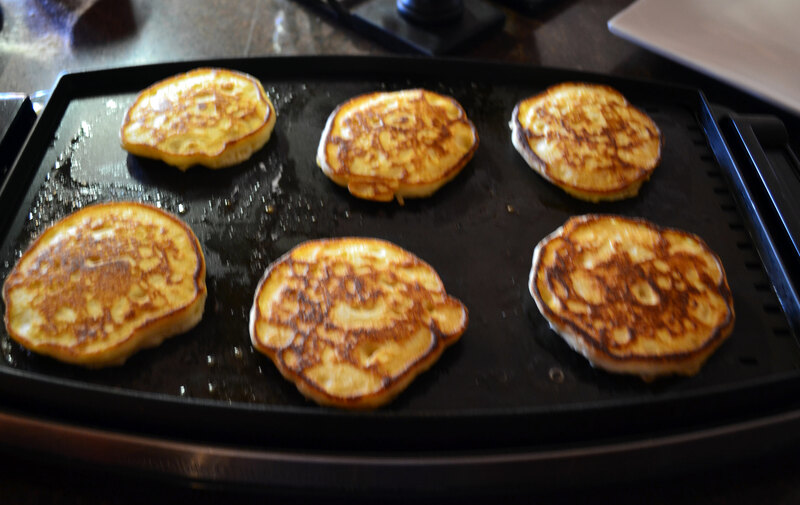 Coating the griddle with butter before each batch of hot cakes will give them a golden, slightly crispy exterior and a lot of flavor – don’t skip it, you will eat oatmeal and berries the other six days of the week. 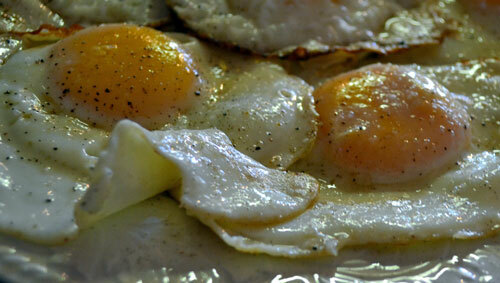 Fried eggs, a little bit of melting butter, warm maple syrup and bacon … Saturday morning perfection! About that twang. 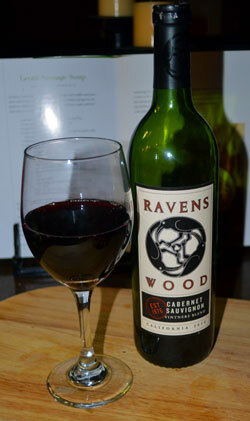 The twang of the vinegar is interesting (deliciously so) and is definitely distinct. 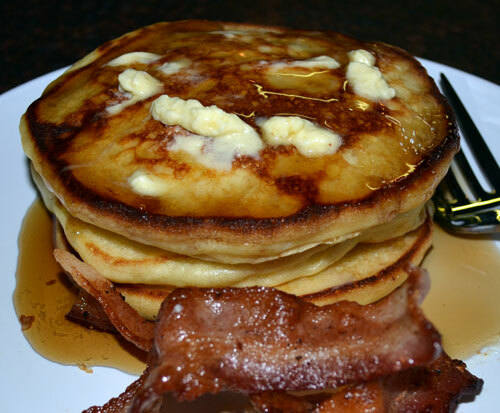 The flavor is offset by the sweet of the syrup and the combination makes for one heavenly stack of pancakes hot cakes. As always, enjoy! And let me know what you think, I love hearing from you. 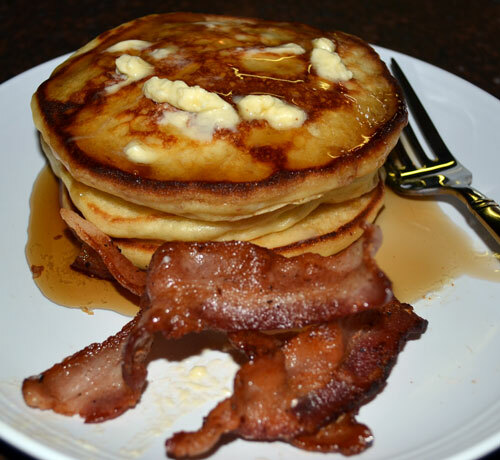 This entry was posted in Breakfast & Brunch, Family Cookbook Project, My Favorite Recipies, Sweet, Welcome Company, Welcome to My Kitchen and tagged Breakfast, Brunch, cooking, food, Hot Cakes, Maple Syrup, Pancakes on February 25, 2013 by Welcome Company with Danielle. I can’t remember which dinner favorite number I’m on, so I’ve decided to drop that catchy part of the dinner favorite series. Suffice it to say that this hearty, healthy and insanely delicious soup is most definitely a favorite – even with the kids. Right! 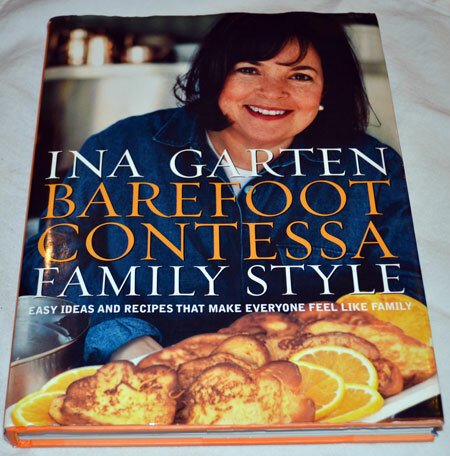 The Barefoot Contessa. Oh to be “Barefoot in Paris” – well, not all of Paris but I’m sure there are some parts where it is safe to be barefoot – a park maybe? The Jardin des Plantes or the Champ de Mars (I totally googled those) or the Louvre – okay maybe not the Louvre. If you ever do go barefoot in the Louvre in Paris, you really do have to come back here and tell me all about it! Anyway, all tangents aside, this soup is one of my all time favorite things to eat. 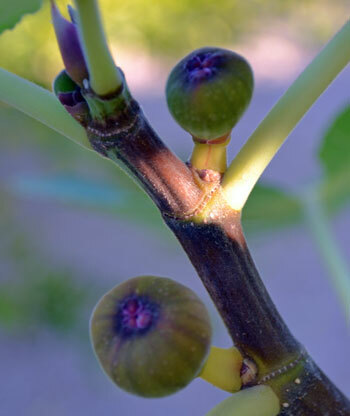 In case you were starting to think otherwise, we really do eat pretty healthy around here; apple dumplings and fancy mac and cheese are treats, delicious heavenly treats, but not staples on the regular menu. 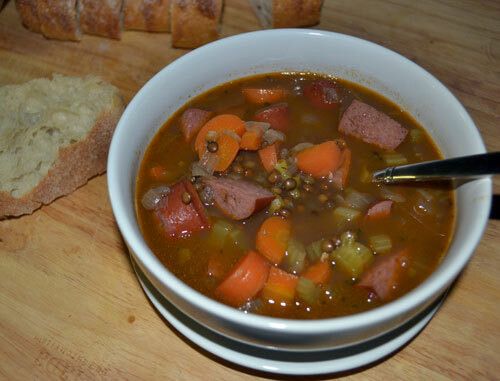 Like so much of the food I love, this soup holds special memories for me. One of the first times I made it was two years ago when my high school friend Tara came from San Francisco to spend Thanksgiving with us. She flew in late in the evening, the Tuesday before Thanksgiving, after a long day of work in the corporate jungle. 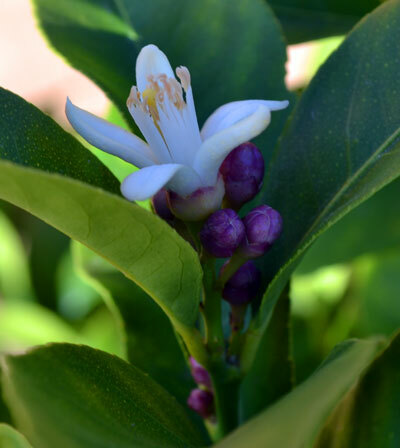 I knew that she needed to walk into warmth and comfort, feeling welcome and at home and wondering what that amazing smell was coming from the kitchen. It’s my job to know, I’m her friend. 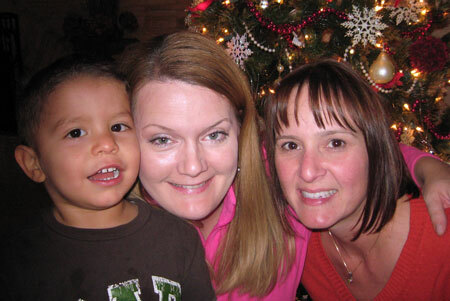 After a big hug and a few tears, I invited her to settle into the guest room, put on her jammies and warm socks and relax by the fire; letting the stress of a hectic pace and demanding job begin to melt away (and be replaced by the stress of three wild, really loud little kids who all want “Auntie Tara’s” attention at the same time – never mind that, just think warm and peaceful thoughts; it helps). 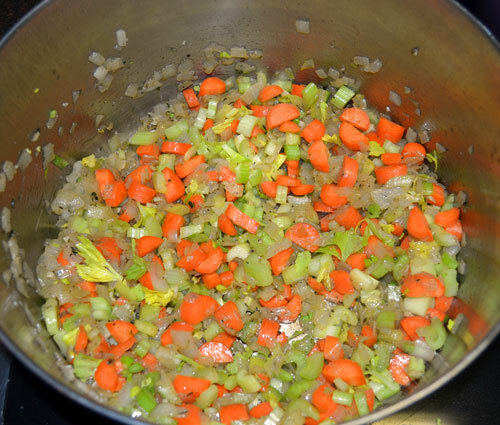 I made quite a few yummy things for her during that visit (including Thanksgiving dinner) but that first evening of catching up around a warm fire with a steaming bowl of this soup is what stands out most in my memory. I hope it does in hers as well. I love you my friend. Yes, it looks delicious and it tastes even better. Give yourself about two hours. 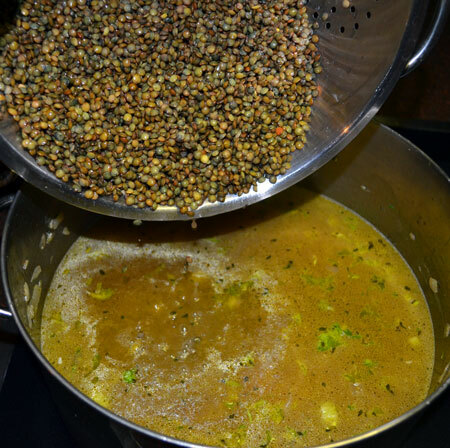 The soup is easy to make but time-consuming with a lot of chopping and important steps that ensure proper flavor development. Take your time and enjoy the process, that is, afterall, half the joy of creating a dish like this. I can only find them at one store (a specialty grocer) and they are pricey but Ina swears they are the most tender and flavorful of the lentils. Who am I to question? I will try it sometime with brown or red lentils though, just to see for myself. 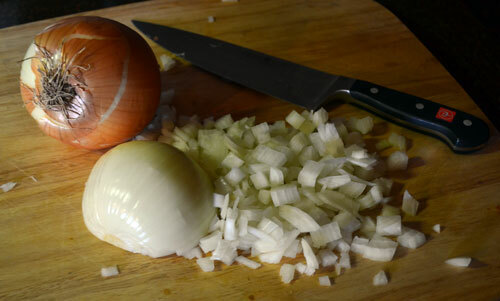 onions and leeks – sorry, I forgot to buy the leeks this time but the soup turned out great anyway. 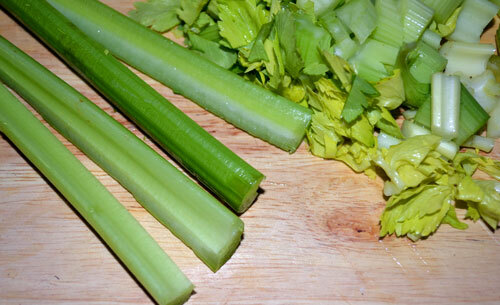 Celery, medium dice as well – split the stalk lengthwise and chop; be sure to use the celery leaves too, don’t throw them away. 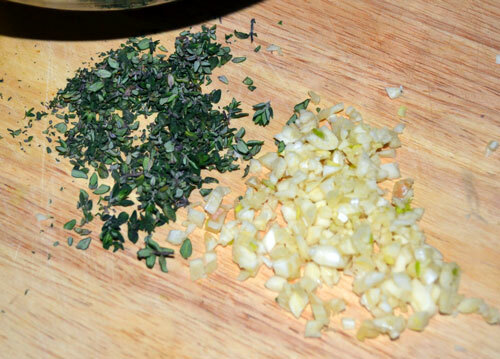 Thyme and garlic. Be still my heart. 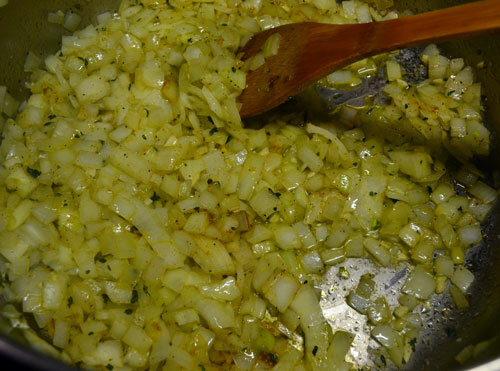 Saute’ the onions, leeks (if you remembered to buy them), garlic, thyme and seasonings first. 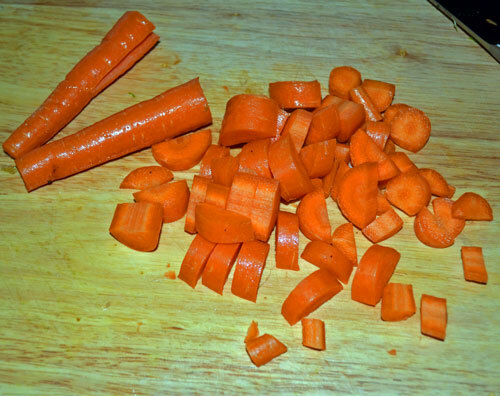 Add in the celery and carrots. 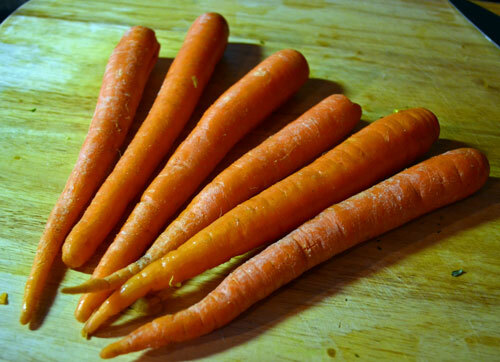 If you are a food nerd like me, you can tell me what the French term is for the carrot, celery, onion combo – I know you can, even if you won’t admit it. Then the chicken stock, tomato paste and lentils. 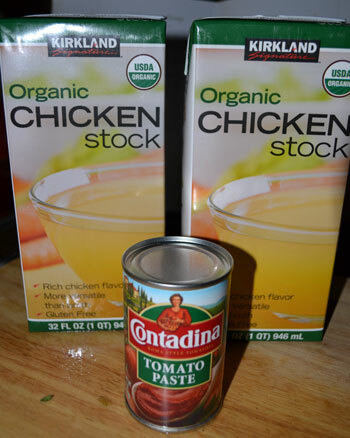 Use a good chicken STOCK, not just broth – it really does make a difference. 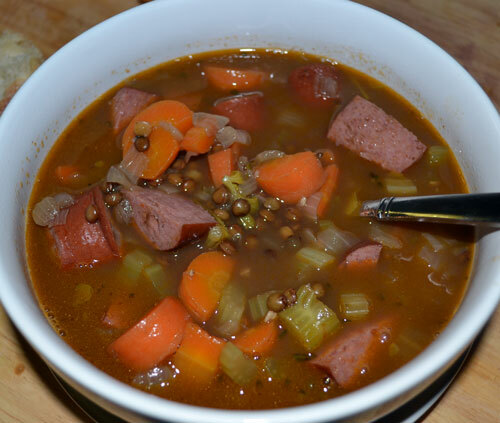 Add in the Kielbasa – the lower fat Turkey Kielbasa tastes great in the soup and is better for you. all that’s left is to sit down with someone you love and make some happy, warm memories. This entry was posted in Entertaining Company, Family Dinner Favorites, Holidays, Parties & Celebrations, Main Dishes, My Favorite Recipies, Savory, The Company I Keep, Welcome Company, Welcome to My Kitchen and tagged Barefoot Contessa, Comfort Food, Company, food, Friendship, Guests, Ina Garten, Lentil Soup on February 22, 2013 by Welcome Company with Danielle. She seems like such a nice woman. She’s a loving wife and a great mom. 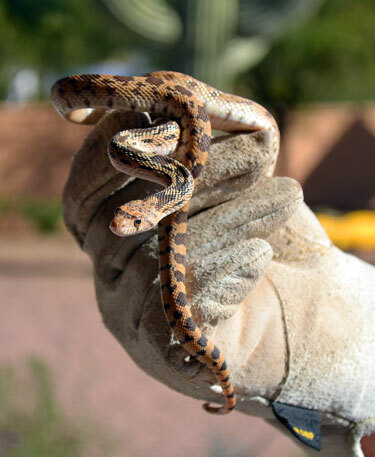 A good friend. She is kind to animals and loves dogs and horses. She openly shares her life and her recipes. 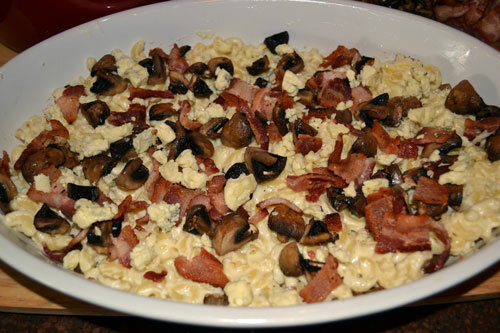 She calls it “Fancy Mac and Cheese”. It sounds sweet and safe and wholesome. A few Saturday’s back, I watched her make it. Smiling innocently, sweetly, looking fabulous. 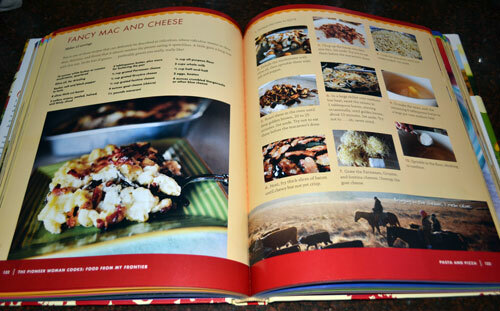 After the episode ended, I pulled out her cookbook to look “Fancy Mac and Cheese” up for myself. Surely my eyes had deceived me. I must have imagined it. 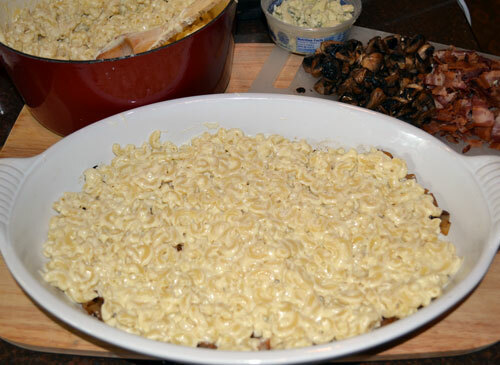 Five kinds of cheese, carmelized onions, bacon, roasted mushrooms, bechamel. It couldn’t be. No one has the nerve for such a thing. But there it was. In print, before my eyes. Undeniable. 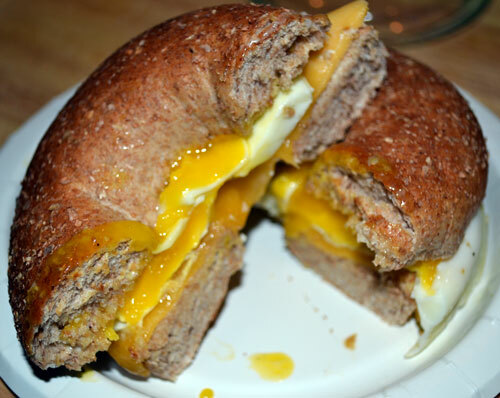 In all its sinful, gooey, calorically off the charts glory. Fancy. Fancy, nothing – this stuff is WICKED. When faced with such obvious decadence, what’s a girl to do? A disciplined girl would close the cookbook, back away and make a salad. What did I do? I made Fancy Mac and Cheese. 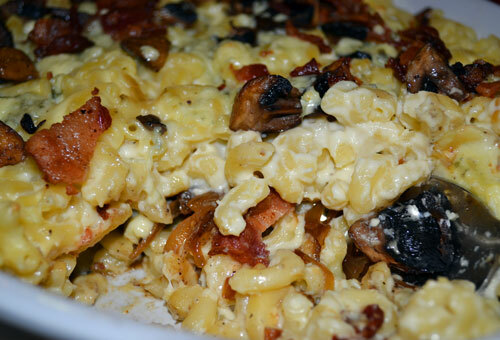 That is my confession … I made Fancy Mac and Cheese. I MADE FANCY MAC AND CHEESE! 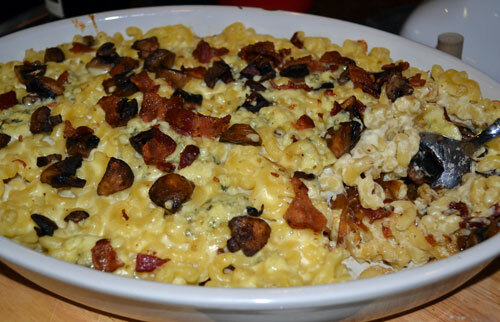 And then I ate Fancy Mac and Cheese, just a little bit but I still ate it. 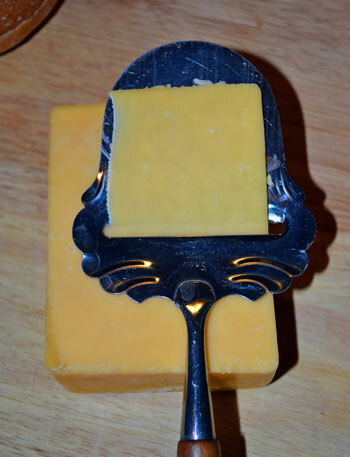 I ATE FANCY MAC AND CHEESE! 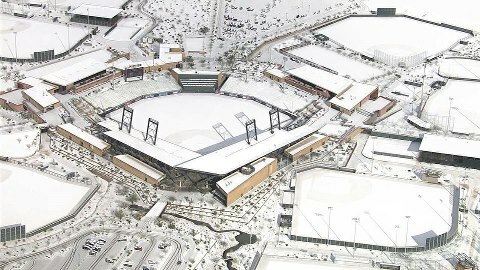 All I can say is … Holy it was worth it Batman! Five kinds of cheese, nope I wasn’t kidding; gruyere, fontina, parmesan, gorgonzola and a nice hunk of goat cheese. I know. Just wait, It gets even better/worse. 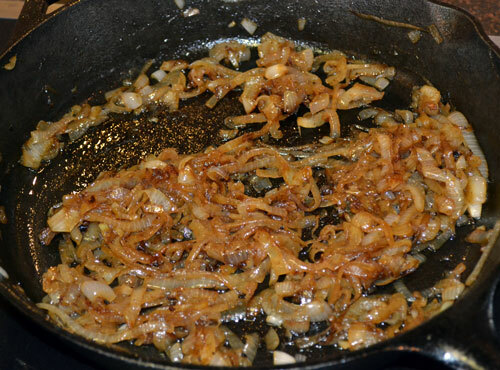 And carmelized onions. 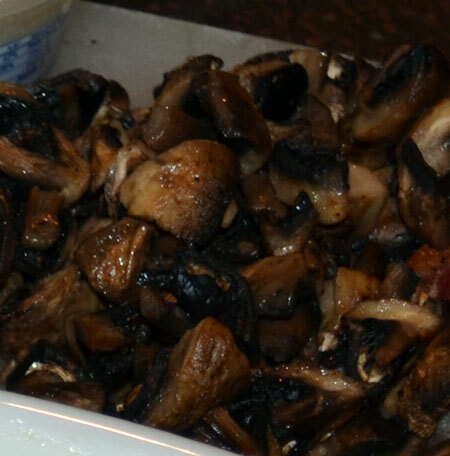 I’ll give you one guess as to what they were carmelized in. 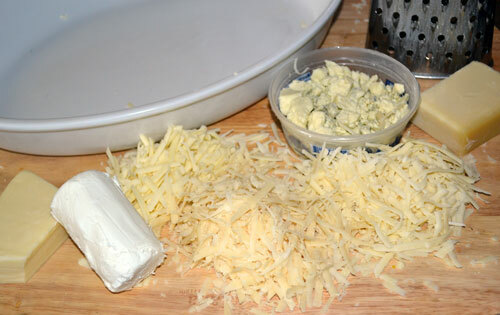 Next, the cheese sauce – a bechamel with the gruyere, fontina, parmesan and goat cheese. 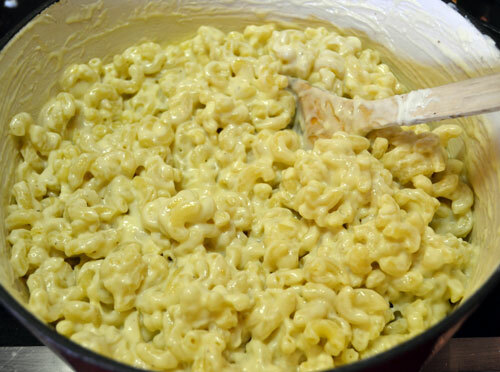 Pretty much the perfect cheese sauce for macaroni. 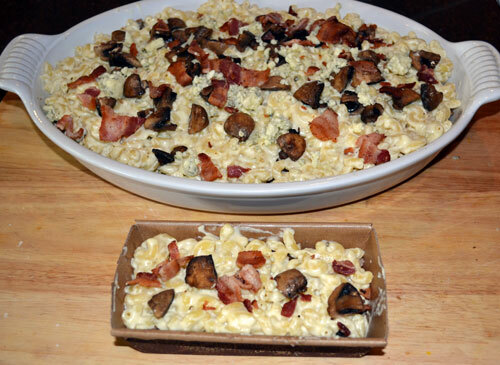 next the mushrooms, gorgonzola and bacon and then repeat the layers. 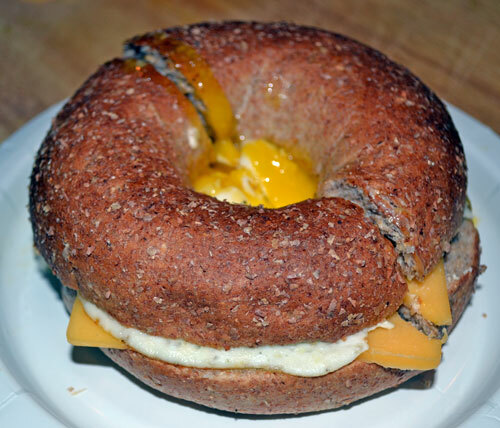 There it is, maybe the most decadent savory treat ever created. I served it with a big green salad. You know, to make myself feel better. And I shared – to spoil a friend, minimize leftovers and make myself feel better. 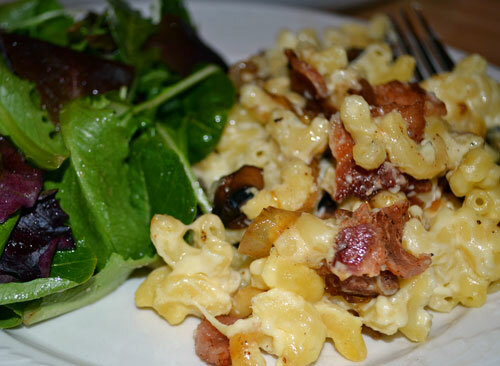 If you need to make a Fancy Mac and Cheese confession, I am here for you. I understand. 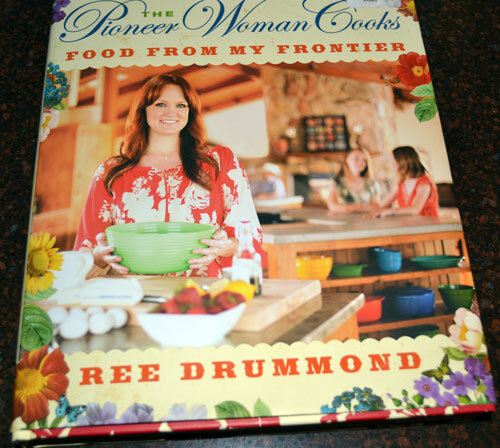 This entry was posted in Entertaining Company, Main Dishes, My Favorite Recipies, Savory, Welcome Company, Welcome to My Kitchen and tagged cooking, Dinner, Fancy Mac and Cheese, food, Macaroni and Cheese, One Dish Meals, Pioneer Woman, Ree Drummond on February 21, 2013 by Welcome Company with Danielle.